The Disney Legends Award is presented annually to a person who has left a significant impact on The Walt Disney Corporation. 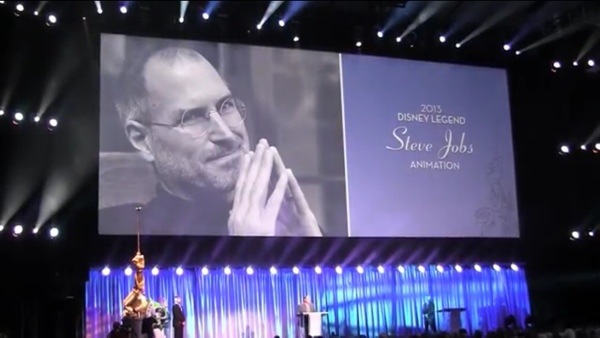 This year, the late Steve Jobs received the honor, and last night John Lasseter accepted the award on Jobs’ behalf at the D23 Expo. Lasseter is the Chief Creative Officer at Pixar, a studio Jobs co-founded, and Walt Disney Animation Studios. He created Toy Story and is arguably the most influential and iconic storyteller in the history of animation. Disney CEO Bob Iger announced the award before brining Lasseter onstage to accept. Both men were friends with Jobs, and Lasseter got chocked up a few times while sharing stories about Jobs influence on the early days of Pixar.